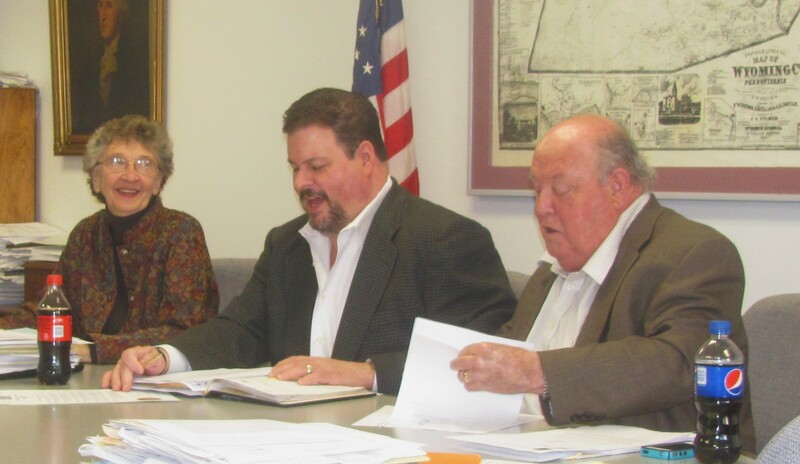 Wyoming County Commissioners (from left) Judy Mead, Tom Henry, and Ron Williams sign proclamations and other documents during their April 22 meeting in Tunkhannock. 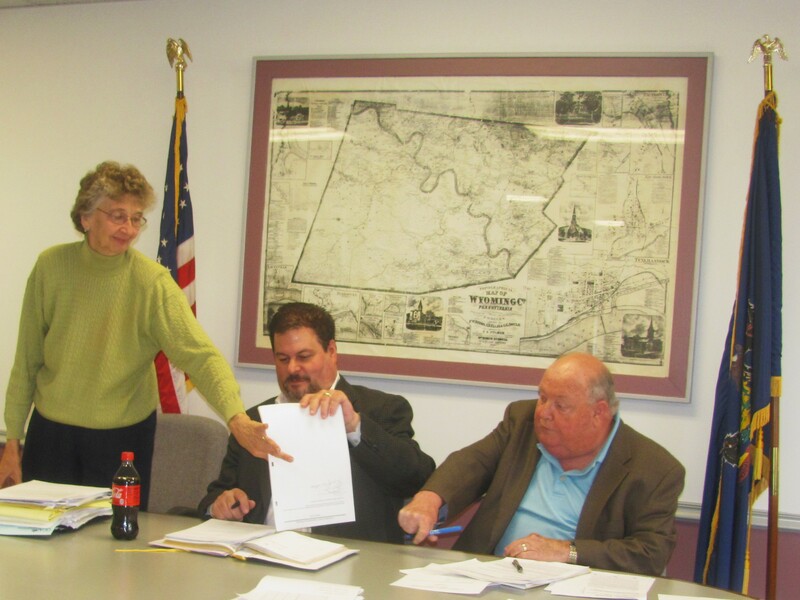 Among other agenda items discussed at the regular meeting of the Wyoming County Commissioners on April 22 was the adoption of a new set of rules and regulations for tax appeals. The commissioners also ratified a proclamation marking Library Week, approved an IT internship for a Keystone College student, and signed a service agreement for Children and Youth Services. Under Pennsylvania law, property owners have the right to appeal assessments if the owner feels that the figure is unfair, not uniform with other assessments, or not a fair market value. The new 30-point document drafted by Kathy Voda and the Wyoming County Board of Assessment Appeals spells out the circumstances under which a hearing would be warranted and helps to prepare both the homeowner and the assessment office for the process. According to the commissioners, the previous rules and regulations were upgraded to bring both the county and residents onto the same page. “This will make it a lot easier for everyone,” said Commissioner Tom Henry, noting that new policy will help landowners be better prepared by knowing what exactly the Assessment Board will expect of them when the hearing is held. A copy of the rules is available at the courthouse in Tunkhannock from 8:30 to 4 pm on weekdays. For more information, the office can be reached at 570-996-2262. The commissioners approved the purchase of three new Seiko printers at the request of Election Board Director Flo Ball. There were problems with the printers used with Touch-screen voting machines in Eaton and Meshoppen Townships during the last election. The machines will cost about $650 each, and the third printer will be stored as a backup unit. According to the commissioners, the purchase fits within the budget of the election department. The commissioners were pleased to accept an application for an internship for Keystone College senior James Dewitt, who will assist the county’s IT Director, Tom Katchur. Henry indicated that Katchur has his hands full and the help will be appreciated. Commissioner Ron Williams highly recommended Dewitt and was hopeful that, if the internship goes well, a more permanent position might be found for him upon graduation as the county’s dependence on integrated technologies grows. There is currently no cost to the county. Linda Swenson was subsequently awarded a services contract for Wyoming County Children & Youth Services. In other news, Solicitor James Davis noted that the issue with the lease for a communications tower situated on land owned by Shadowbrook Resort was not yet resolved.